A wise saying claims that children become readers on the laps of their parents. A story well told can make us laugh, weep, swell with pride, or rise with indignation. Storytelling entails ways to make a child curious and encourages them to ask questions because this makes the child think. They learn to associate images in the book with the story and this develops their visualization capacity and imagination. It is a delight indeed when you open up a book to the young ones and watch as the world opens up before them. Not reading good books narrows down the outlook of children as they grow into adults. The Premier’s Reading Challenge is aimed at encouraging the love of reading for leisure and pleasure in students and to enable them to experience quality literature. More than a competition, it is a challenge for each student to read more widely. 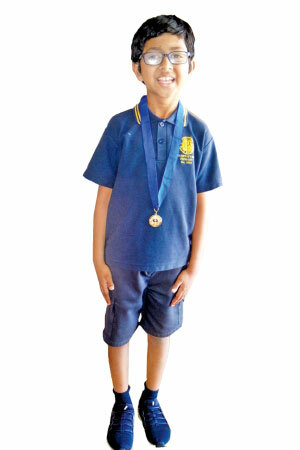 Eight year old Omesh Wickremasinghe recently won the Premier’s Reading Challenge Gold Medal for English Reading for 2018. 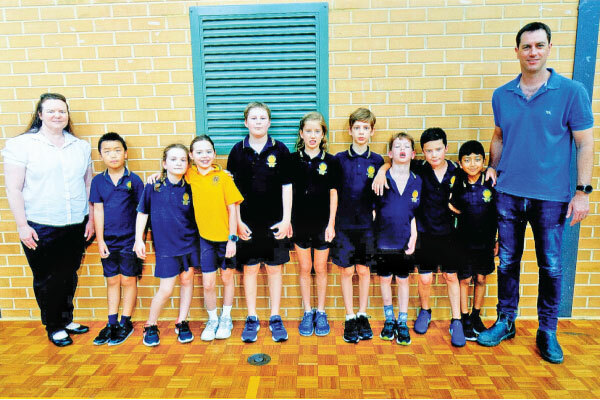 The Sri Lankan lad who resides in Adelaide, South Australia, had taken part in the competition from Recess up to Grade III. He had received a certificate for his readability during his first attempt. Later he clinched the Bronze Medal and followed it up with a Silver Medal. Last year he was able to bag the Gold. 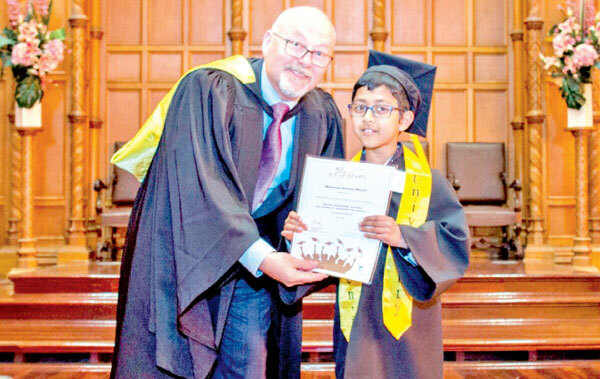 A grade III Student of Marryatville Primary School, Adelaide, Omesh had developed a passion for reading from a young age. It had started from having to read story books borrowed from the school library and having to pen a summery of the story to present to his class teacher. “I took to reading story books regularly and was soon engrossed in the world which opened before me in the stories. I couldn’t wait to finish one story and get to another one. When my grandmother comes to visit us for the Christmas vacation, she reads with us. She is an avid reader and my mother used to take us every fortnight to the Burnside Library where we got the opportunity to borrow all kinds of books and magazines. This developed my love for reading further,” Omesh explained. He notes that his class teacher Ms Shywallop had told him about the event and had encouraged him to take part. The challenge consisted of each student having to read a book given by the authorities for more than half an hour. A few listeners were near at hand to judge the student’s reading abilities. 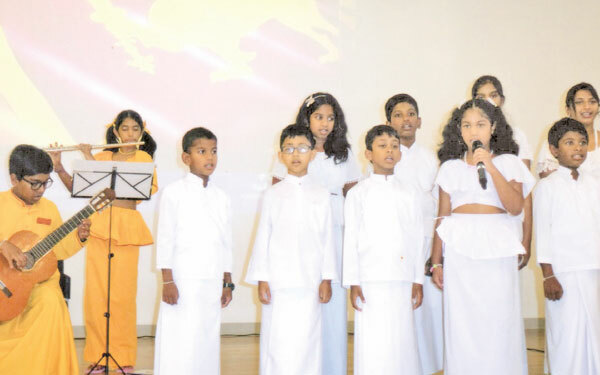 Singing the National Anthem of Sri Lanka and Australia with the other children of Adelaide Sinhala School at the Sri Lankan Independence Day celebrations. “I was thrilled when I got to know that I have won a Gold Medal. When my father came to pick me up I ran to him to show the medal. He and my sister admired it and they both congratulated me. 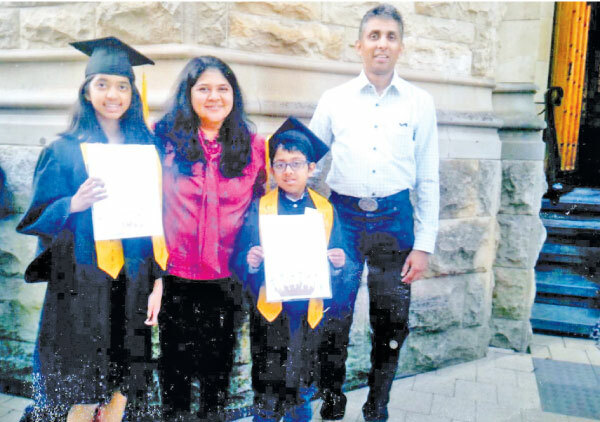 I was waiting to show the medal to my mother because she always motivated me and my sister to engage in reading,” Omesh said. He is hopeful about clinching the Champion Medal next year. Most of the students from Marryarville Primary School took part in the challenge which was organized by the school authorities. “Everyone in my class took part in the event. A few of my friends won Silver and Bronze medals. However there were only a few Gold and Champion Medal winners. I believe that my ability to read and pronounce words properly without pausing helped me bag the Gold Medal,” he enthused. Omesh’s interest lies in pre-historical species. He has a collection of books and magazines based on dinosaurs, mammoths and all kinds of pre historic birds and marine life. “I think that it is a pity that such animals became extinct. Reading such material is so interesting. I feel like I am being transported back in time when I leaf through such reading materials,” he expressed. He also enjoys reading adventure novels and all kinds of fiction. He enjoys making origami dinosaurs, doves and dragons because it helps him ward off negative emotions like anger and help spread love and kindness towards others. “It is something that we have been taught at school. We are taught the importance of mindfulness and how to keep your temper under check. I would always encourage children to take to books from a young age because it will arm you with a lot of knowledge. Learning about the world around us and its living beings is very interesting. It enriches your creativity too,” Omesh opined. His other pet subjects at school are science, physical fitness and French. He also plays basketball, soccer and cricket. “My sister and I love swimming and every Saturday we go for swimming at Norwood Swimming Pool. I have joined Swimming Carnivals and try my best to win at such events,” he added with a smile. 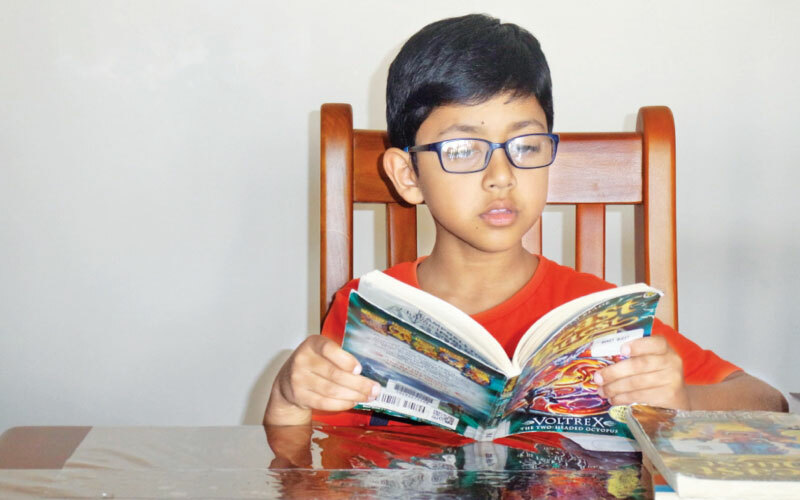 Omesh notes that he would encourage other children to take part in the Premier’s Reading Challenge because reading helps a person develop a clam personality, enhances his or her intelligence and prevents them from building unnecessary associations. Omesh’s father, Sanjeewa, is employed at Tony & Marks. His mother, Harshini, is a Senior Accounts Clerk. His sister, Oneli, is a Grade nine student at Maryatville High School. Omesh wishes to become an explorer or a zoo keeper when he grows up. His message to other youth is to develop an interest towards their work at all times and to live in harmony with others.